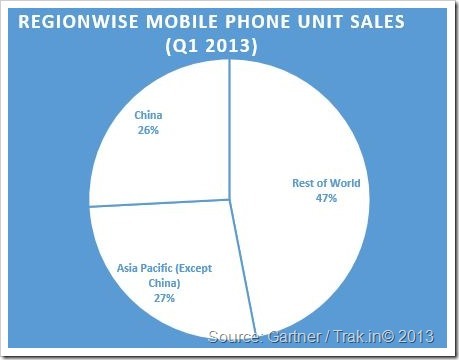 Asia Pacific was the only region where sales of Mobile phones witnessed growth, compared to all other regions where it declined according to Gartner Worldwide mobile phone sales report for first quarter of 2013. Asia Pacific region alone accounted for 226 million mobile phone units out of 426 million sold worldwide in the first quarter of 2013. Asia Pacific now accounts for 53.1 percent of global mobile phone market share. What is really interesting is relatively excellent growth witnessed by Chinese and local mobile manufacturers. The account for nearly one-third (29 percent) of all mobile phone sold in first quarter of 2013. Samsung remained in the top position witnessing a growth of 13 percent compared to first quarter of last year. Samsung now commands 23.6 percent of global mobile phone market share, while their smartphone market share reached 30.8 percent. Nokia on the other hand continued its fall in overall mobile phone market share which fell from 19.7 percent last year to 14.8 percent this year. The fall was primarily contributed to the decline in feature phone sales. 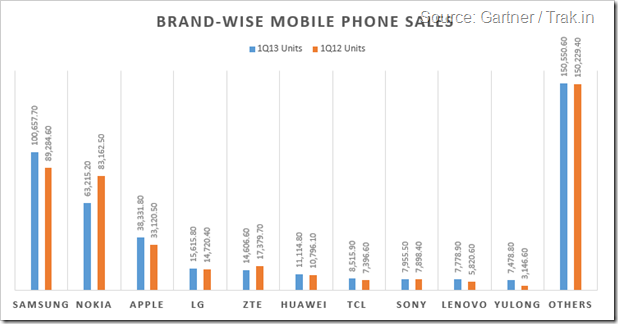 Even in Smartphone market, Nokia’s position dropped to No. 10 in the first quarter of 2013, from No. 8 in the fourth quarter of 2012. Apple witnessed marginal growth on account of good sales figures in China. Apple increased their overall market share from 7.8 percent last year to 9 percent in first quarter of 2013. 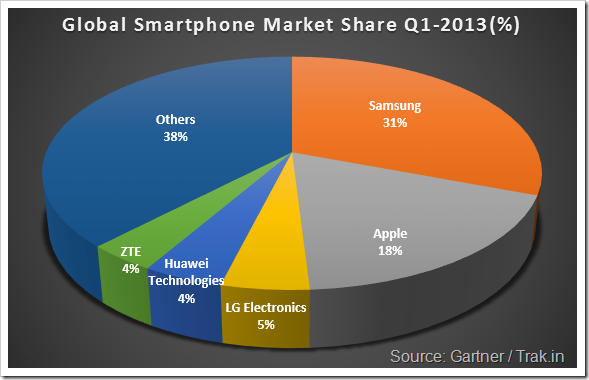 LG electronics overtook ZTE in the first quarter of 2013 for the No. 4 position and increased its market share slightly from 3.5 percent last year to 3.7 percent this year. Android took a giant leap by increasing its market share from 56.9 percent last year to 74.4 percent this year. Currently there are 50 percent more Android phones in the market than a year ago. Apple on the other hand witnessed a drop in their market share falling from 22.5 percent last year to 18.2 percent last year. Research in Motion’s market share declined to less than half compared to same quarter last year – From 6.8 percent to 3.0 percent this year! While Microsoft is steadily gaining in Mobile OS market increasing its market share from 1.9 percent last year to 2.9 percent this year! 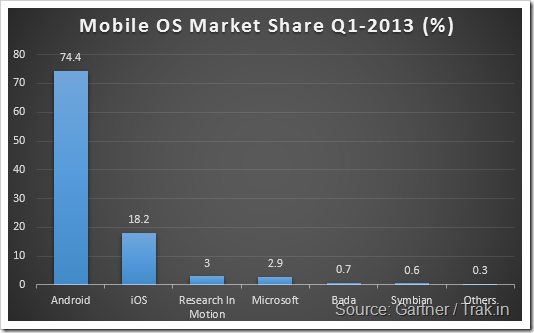 Symbian was the biggest looser in the OS market – Their market share is now nearly completely eroded from 8.5 percent last year to only 0.6 percent this year. Check out Gartner’s complete report here.